What watch are you currently wearing? Around the time I bought it, my everyday watch was an Omega Speedmaster Reduced, but I was looking for something unique that I could wear for special occasions. In December 2017, my father showed me a newspaper ad that fit the bill – totally old school. Unfortunately, the seller had already sold the beautiful Datejust 1601 with a linen dial that had been in the listing, so he offered me this 16013 instead. At first, I thought: a two-tone watch with a diamond dial? That’s a bit too much. But once I found out I only had to drive 10 minutes to look at it I said, “Well, why not? I’ll take a look!” The seller was an older gentleman and passionate watch collector. We were immediately on the same wavelength and spoke about our hobby over a cup of coffee. To make a long story short, the watch turned into something special and I decided to buy it. What do you like most about this watch? This watch is special in every sense of the word. I still like the timeless design of the Datejust and the 1980s vibe of this model. The story of how I bought the watch was pretty unique. I still meet up with the seller and have even been invited to join his private watch club. What role does this watch play in your collection? For me, it represents how things don’t always go according to plan. It showed me that it’s worth taking a chance and being open to things that you initially weren’t so sure about. 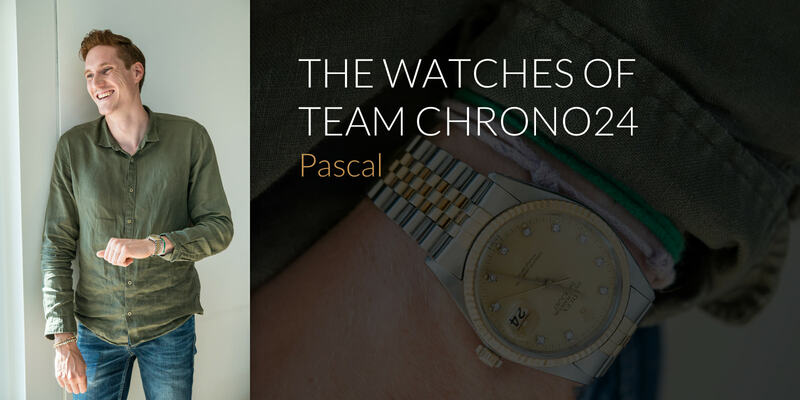 I’m fascinated by the stories and people that are linked to watches. It may sound trite, but I think Patek Philippe is right: You never actually own a watch. You merely look after it for the next generation. My first watch was a child’s watch that I received when I was about 7 years old. I can just vaguely remember it, but it was green (with dinosaurs on it I believe – a “dino dial” in today’s terms) on a green textile strap with a Velcro fastener. What a dream! I don’t want to limit myself to certain brands at the moment. In general, I’m drawn to vintage models from Rolex, Omega, and Cartier.